Fishing Creek Farm has a private marina on Duvall Cove which includes thirty-six slips, three reservable temporary slips and some transient slips. The outer slips are suitable for deeper draft vessels. A mooring field in Duvall Cove provides space for additional community boats. The marina includes a jet ski dockage area. 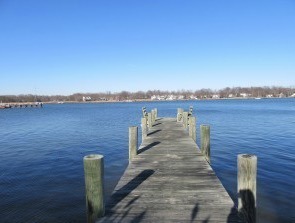 Small boat dockage is available for the season along the pier. A pump out station is located at the pier. 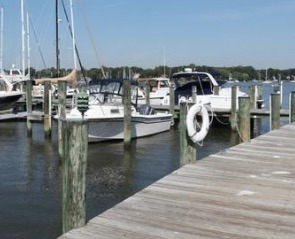 The private boat ramp is adjacent to the marina for easy launching for non-slip holders. Some of the slips are equipped with power lifts. If you wish to reserve a transient slip and are a guest of one of our homeowners, click here to make your reservation now. Completely renovated in 2013, the Fishing Creek Farm community clubhouse is ready to host your event, and is the hub for the many Fishing Creek Farm social functions. With room for meetings/parties of up to 85 people, the clubhouse sits on the second level overlooking Duvall Cove and has an extended, furnished deck area with wonderful waterside breezes and sunset views. The clubhouse boasts a totally renovated kitchen which includes basic entertaining supplies and a suite of brand new appliances, tables and chairs, a sound system and completely renovated rest rooms. The clubhouse is available for rental for a flat fee of $100 per day. 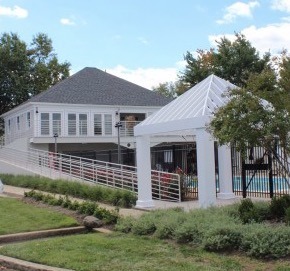 Please note that the clubhouse rental does not include access to the community pool. If you are a homeowner and wish to reserve the Fishing Creek Farm clubhouse for your private event, first login to our site, and then click on the clubhouse rental menu item under Amenities > Clubhouse. 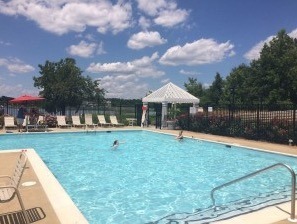 Open Memorial Day through mid-September, the Fishing Creek Farm pool is located on the waterfront, adjacent to the community marina and clubhouse. A gated baby pool with a gurgling fountain is a favorite gathering spot for the youngest members of the community. Staffed with licensed lifeguards, the pool is open 12:00 noon – 8:00 p.m. daily in the season, with extended Friday hours of 10:00 a.m. – 9:00 p.m. Redesigned and renovated locker rooms are ADA compliant. Waterside breezes, corn hole, an outdoor ping pong table, built in bar area, full refrigerator access and plenty of tables and lounge chairs makes the Fishing Creek Farm pool the perfect gathering and entertaining spot in the warmer months. The pool is available to homeowners to rent outside normal pool operating hours only. If you are a homeowner and wish to reserve the Fishing Creek Farm swimming pool for your private event, first login to our site, and then click on the swimming pool rental menu item under Amenities > Swimming Pool. Totally resurfaced in 2013, the tennis court is located in one of the community’s many open areas. Surrounded by woodlands just off the South River, the tennis court is available to homeowners all season. During the summer months, tennis lessons for children are available for homeowners. Click here for the access code to the tennis court (homeowners only).If you are a homeowner and wish to reserve the tennis court, first login to our site, and then click on the tennis court reservations menu item under Amenities > Tennis Court. Adjacent to the community marina, the Fishing Creek Farm boat launch makes access to the South River via protected Duvall Cove a breeze. Nearby boat racks mean paddling, rowing or small boat sailing is quick and easy. Homeowners can launch from here and reserve temporary slips at the marina if they so choose. 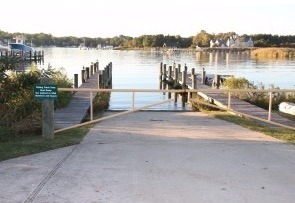 Temporary dockage is permitted on the outside slip of the boat launch for short periods of time. If you are a homeowner, and wish to use the combination to the boat ramp or marina gates, first login to our site, and then click on the marina committee menu item under Amenities > Marina. The latest combination will be listed. With over 100 acres of protected open space, and shoreline extending along Fishing Creek, the South River, Cherry Tree Cove and Duvall Cove, the community has many secluded waterfront spots. 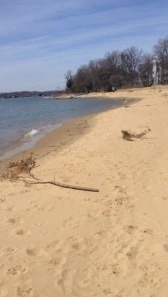 One unspoiled stretch of beach is located along the South River and is accessible via a pathway restricted to homeowners only. A second tranquil beach can be found along a sand bar extending into Cherry Tree Cove, accessible via two wooded pathways and a bridge extending over onto the beach. Extending 90 feet into Fishing Creek, the crabbing pier is tucked away along a wooded pathway. A kayak rack, built in 2014, is adjacent to the crabbing pier. Benches located at the end of the crabbing pier are the perfect spot for relaxing!